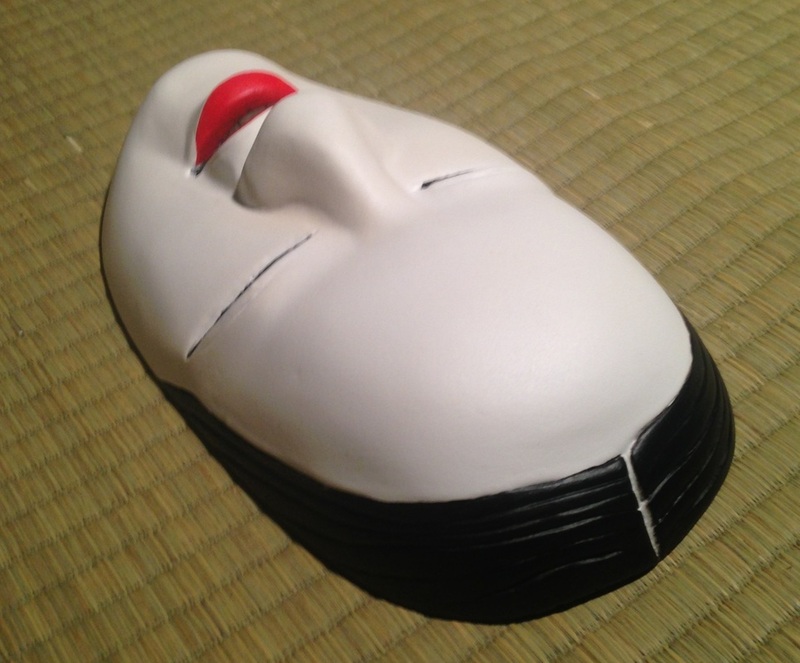 On this page you will find various Japanese inspired art pieces that I have done. This is something that I enjoy however, I do not do it professionally. For me art is a form of meditation and self expressoin. Please enjoy the pics and if you see something that you like please let me know. If you find something that has already sold and you would like one similar or even have an idea for a custom piece please contact me and I would enjoy working with you designing something special. 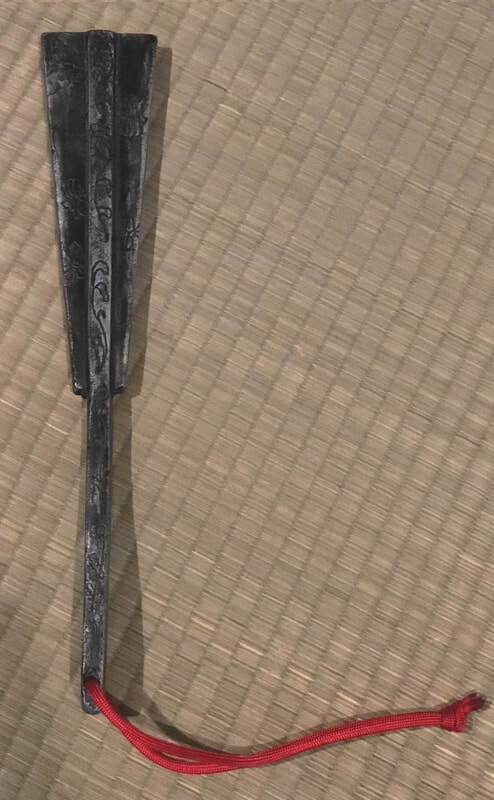 This is a handcrafted Japanese War Fan known as a Tessen (iron fan). These fans were carried by samurai and could be taken into places where swords were not allowed and used for self- defense. This fan is not actually an antique but made to look like one. I make these fans myself and use them for training in my dojo. It is brand new and has never been used. It is not made of iron but cast in solid aluminum and is intentionally made to look like an old heavily used iron fan. It weighs approximately 1half pound and is 11 ¾" in overall length. The handle is 5 1/8" long and the fan is approximately ¾" thick. The cord is about 7" long and is red 550 Paracord. The overall design is that of butterflies and was taken from an antique wooden fan that concealed a blade that I found doing research online. This is a great training tool that has the look and feel of something that has had a long life filled with history. This is something new that I have begun to make. It is a handcrafted Japanese Bamboo water fountain. It measures 39" high, 2.5" in diameter and the spout is 14" long. It comes with a 43.5" of ½ tubing and a brand new 158 GPH miniature submersible pump. What makes this item special is that It is not actually bamboo but made of pvc piping designed to mimic the look and feel of real bamboo. The fountain just inside my dojo gate has be replaces several times over the past years due to it eventually rotting away from always being wet. Even though I have access to bamboo I decided to try something different and make one that would withstand the moisture. Natural bamboo is beautiful, unfortunately as I mentioned it will in time rot away unlike this fountain. No one who has noticed the fresh new fountain at the gate realized it wasn’t real bamboo until they were told. Because of that my with thought it would be a good idea to make this and other styles to sell. You will have the authentic look of bamboo and the strength and longevity of the plastic pipe. If you have any question or would like a specific size, design or color just let me know. This is a handmade Zen style garden bell. It has a square top and weighs about 2lbs, it is approximately 10” to top of ring and 5.25” inches diameter. It is finished in dark hammered bronze to give it a heavier aged look and has a rope with a wooden clapper. It would look very nice adding a touch of detail to one’s Zen garden hanging by the gate or near a pond. However, this simple design would be a nice addition to any garden. It is also light enough to be hung on the porch by a plant hanger. This is a hobby of mine and I make each of these bells myself from old recycled oxygen tanks as well as fire extinguishers. Because of the different shapes, sizes, wall thicknesses and lengths, each bell has its one unique sound. This particular bell was made from a steal fire extinguisher. This bell is in great shape however does have one small dent from its previous life. If you wish, I can make a bell in the color of your choosing as well as much larger heavier styles. Please contact me for details. This is a handmade Zen style garden bell. It has a round top and is quite heavy weighing about 24 lbs. It is approximately 14.5” to top of ring and 8” inches diameter and is approximately ¼” thick. It is finished in a natural rust color to give it and aged appearance. This is a process in which the bell is completely stripped down to bare metal, any wording is ground off, and then left outside to rust naturally. Once the desired effected is reached they are cleaned and then hand rubbed with oil to bring out the natural color which is a dark rust brown. These bells will outlast us all and will only look better with age. It has a rope with a large hand turned wooden clapper inside. This style of bell would look very nice adding a touch of detail to a Zen garden hanging by the gate or near a koi pond. We have one hanging just outside our dojo garden. However, this simple design would be a great addition to any style of garden. This is not a business just a hobby of mine as I make each of these bells myself from old recycled oxygen tanks as well as fire extinguishers. The tanks have been increasingly hard to come by so I do not make them very often. Because of the different shapes, sizes, wall thicknesses and lengths, each bell has its own unique sound. This bell has a beautiful long ring much like a gong. It is designed to struck lightly to get a long beautiful sound. The bell is in great shape and has never been used. If you wish, and I have a tank available I can make a bell in this style or any other color, style and length of your choosing. Please contact me for more details about custom bells. 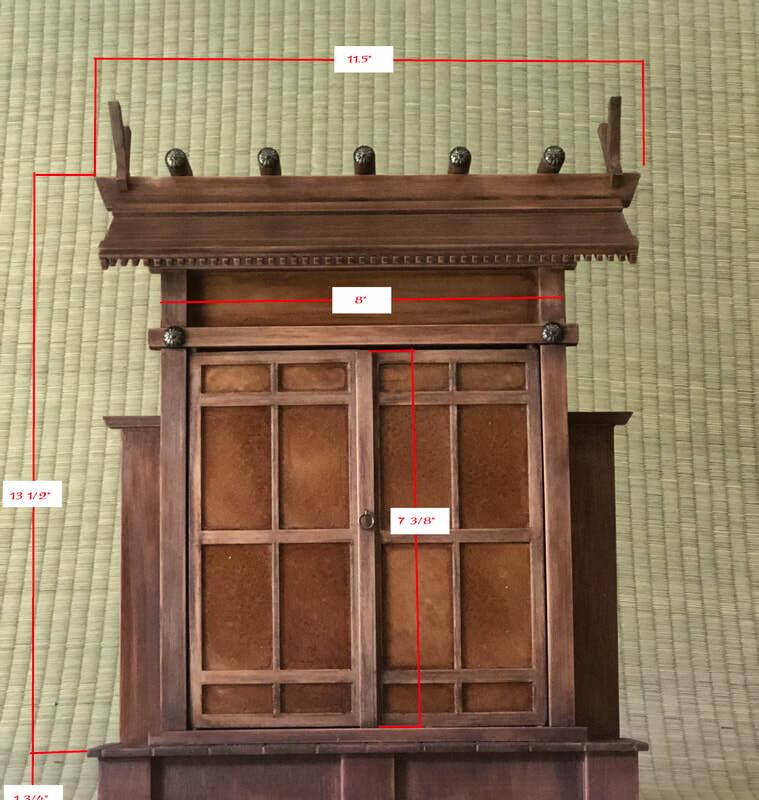 Please notice the description of the bell, look over the pictures carefully and make your decision before committing to pay as I will not take any returns, the bell in the picture is the bell that you will receive. If you have any questions or comments please feel free to contact me any time. I do not profit at all from shipping charges. Shipping is calculated using the USPS website based on the size and weight of each package. Contact me and I will tell you exactly what it would cost to get it to where you are via parcel post and that is what you would pay. It will also include a tracking number and Insurance. Please contact me for shipping charges outside of the U.S. as I do not sell internationally unless I am first contacted buy the buyer and they understand the added cost involved and that there will be no tracking number or insurance. Each item I sell in the U.S comes with a tracking number and insurance. This gives us both piece of mind and we both know where the item actually is during transit. When you receive, a tracking number from me it is only when the item has actually been hand delivered to the post office and shipped. By doing this, the tracking number should work almost immediately. Those who use a package pick up should take no longer than one business day for the number to become active. Be wary of anyone who tells you it takes longer as this is a sign that it is probably a fake tracking number and the item was never shipped. Unfortunately, this has happened to me a couple of times on e bay. In the end I found the number did not exist as well as the item I purchased. 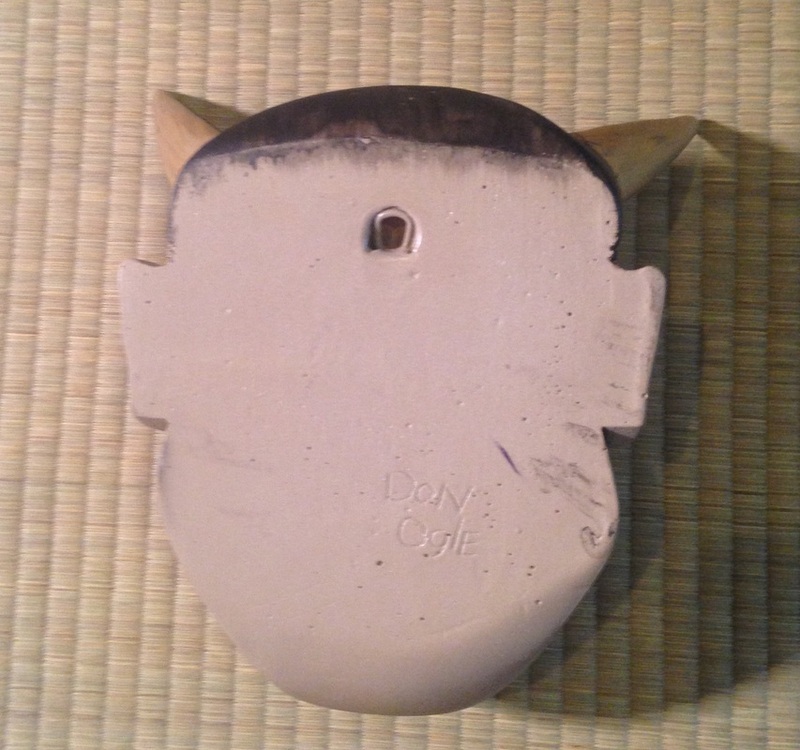 This is a handmade Zen style garden bell. It has a square top and is quite heavy weighing about 30 lbs. It is approximately 13.5” to top of ring and 8.25” inches diameter and is approximately ¼” thick. It is finished in a natural rust color to give it and aged appearance. This is a process in which the bell is completely stripped down to bare metal, any wording is ground off, and then left outside to rust naturally. Once the desired effected is reached they are cleaned and then hand rubbed with oil to bring out the natural color which is a dark rust brown. These bells will outlast us all and will only look better with age. It has a rope with a large wooden clapper inside. This style of bell would look very nice adding a touch of detail to a Zen garden hanging by the gate or near a koi pond. We have one hanging just outside our dojo garden. However, this simple design would be a great addition to any style of garden. 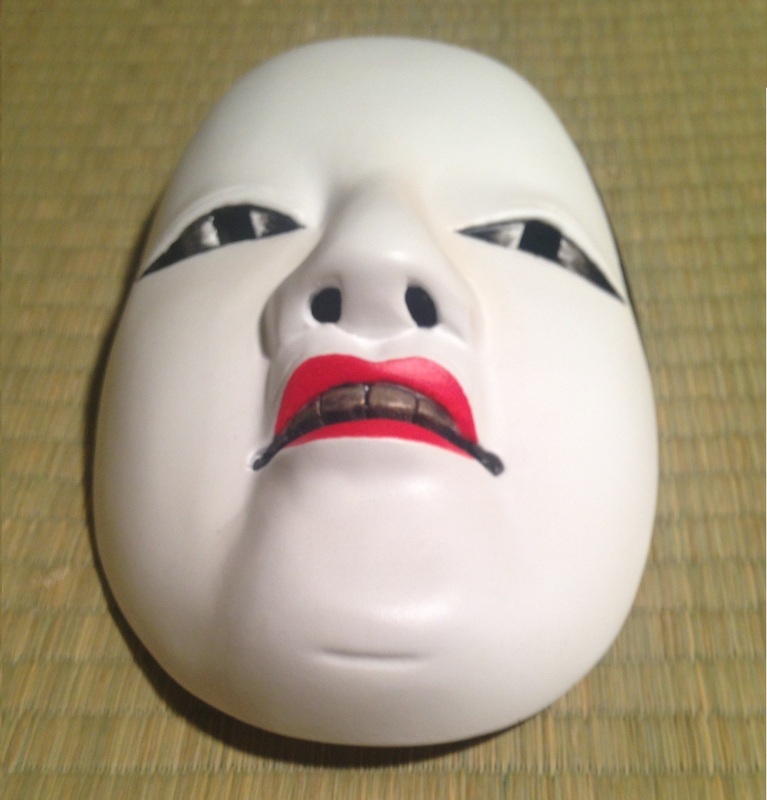 This is a Japanese Ko-omoto Mask. 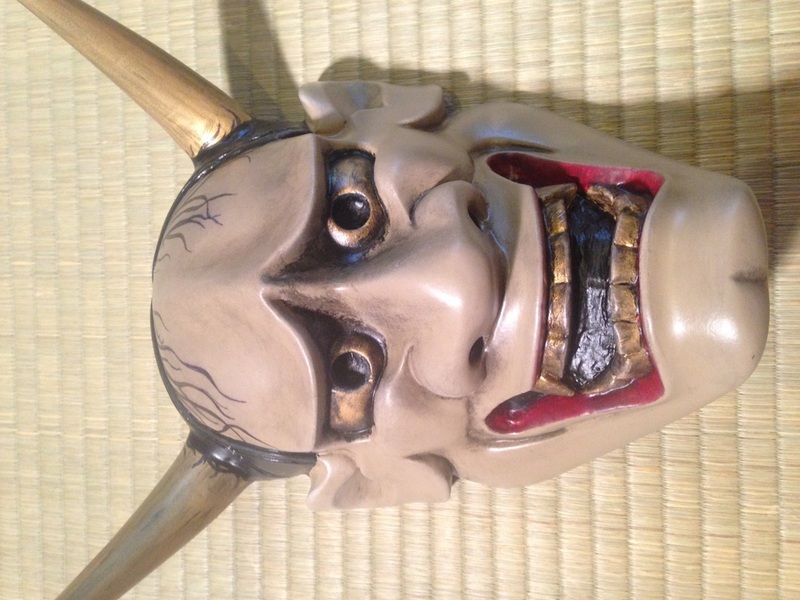 It is handcrafted and painted by myself which makes each mask unique with subtle differences as they are not production pieces.. 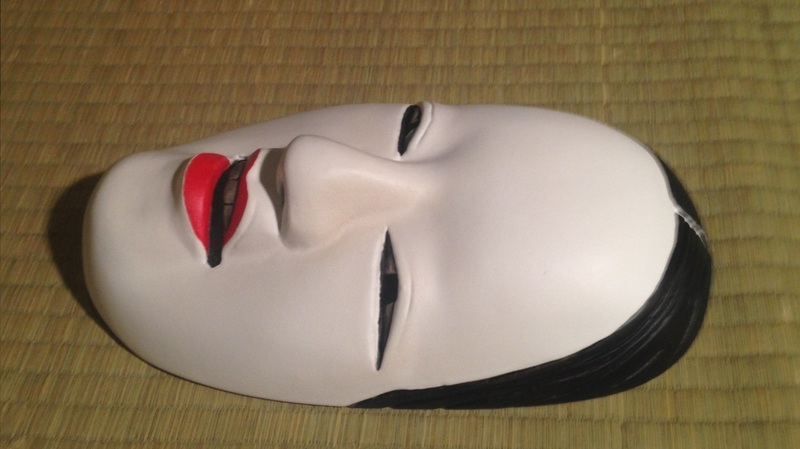 This one is done in a deep mat white with her darkened gold teeth, red lips and mysterious eyes. 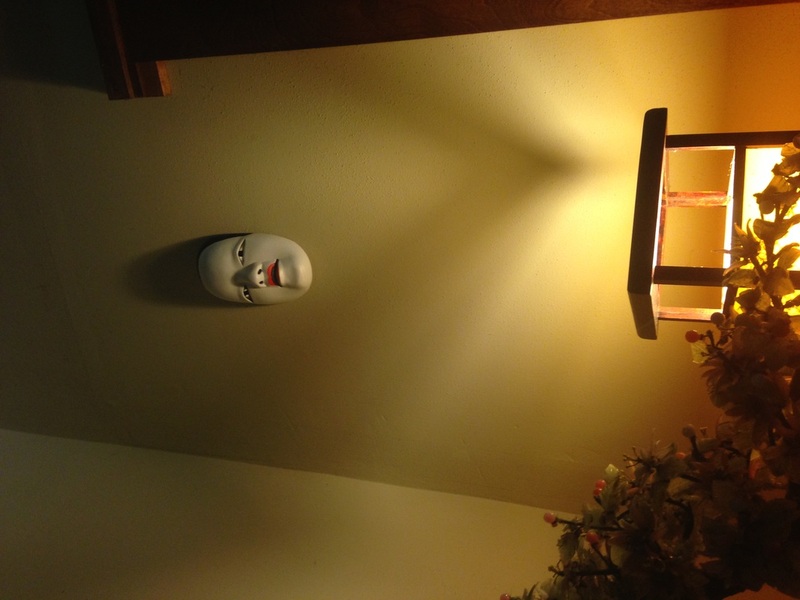 It was cast from an original antique mask that I own. It is for decoration only and cannot be worn. It is made of plaster and has a loop hook made into the back of it for hanging along with my signature. It measures approximately 8 1/2" from chin to top of head and is 5" wide and its weighs less than a pound. The mask is new and in good condition. Please notice the description of the mask and look over the pictures carefully and make your decision before bidding as I will not take any returns. The mask in the picture is the mask you will receive. Making these masks is a hobby of mine and I try to make each one unique. Ko-omote- ( young woman) This mask conveys the beauty of a young girl not yet twenty naive and innocent. 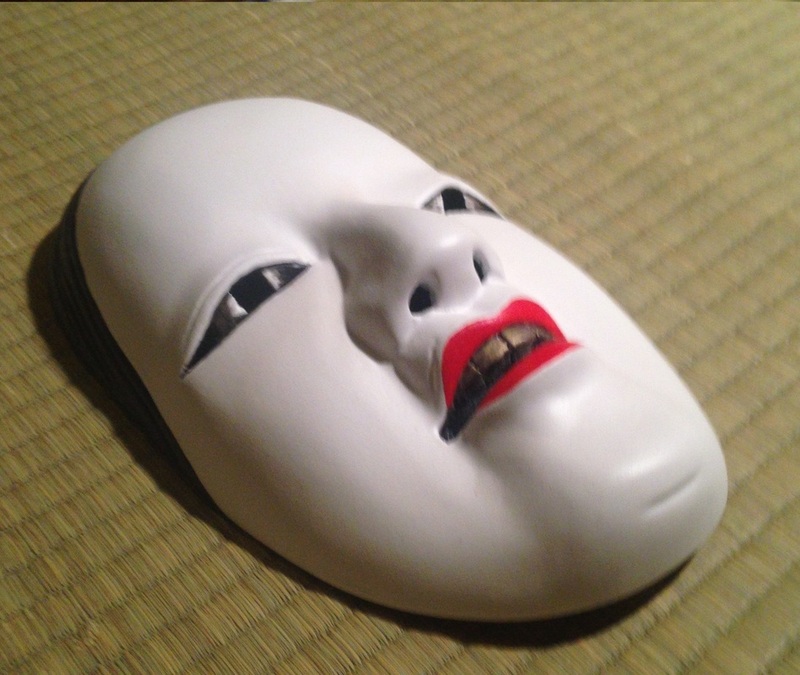 During the Edo Period (1615-1868) a skilled actor can express subtle emotion according to his movements; this is only one of more than twenty other masks for female roles depicted in the Japanese Noh Theater, each varying subtly from the innocence of this mask to convey sensuous, passionate, demented, or supernatural characteristics depending on her state of emotion. 12.85 to anywhere in the U.S. and will be sent with a tracking number and insurance. I made this shrine myself which makes it a one of a kind not a production piece. You will find my personal seal and dojo stamp on the back. It measures 17.5" tall and 19.75" at its widest point. In its construction, I used recycled oak hardwood flooring that was removed from old homes. 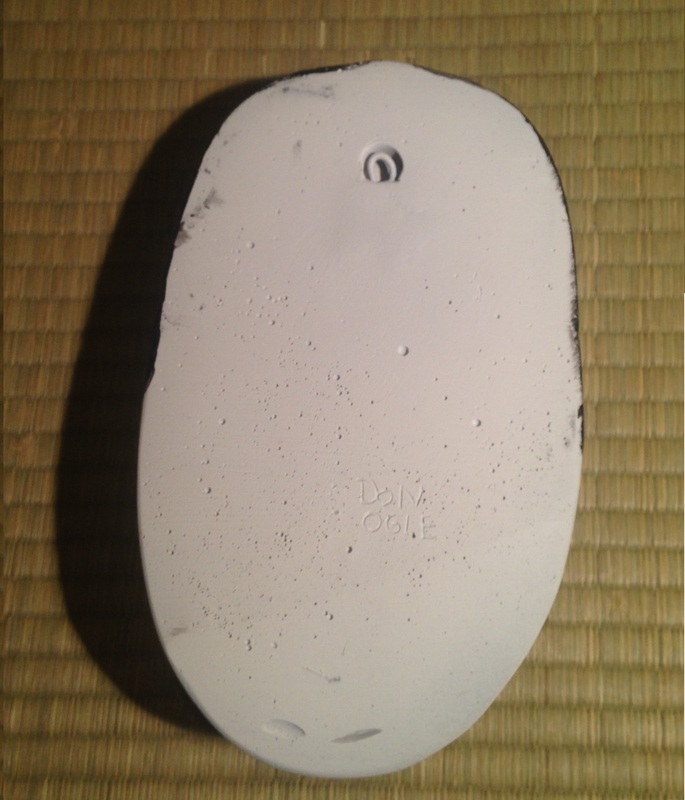 There is also no plastic on this shrine, as you will find on most production pieces. 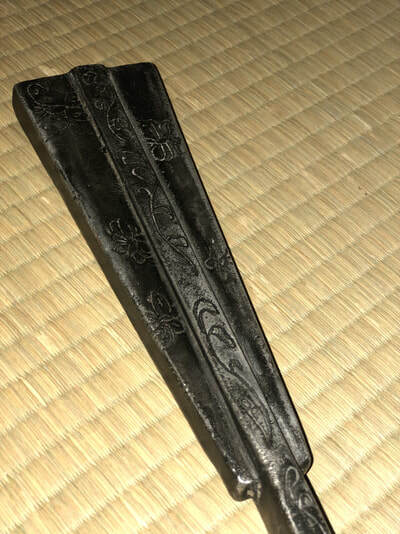 The Kamidana (literally translated as god-shelf) is very popular in Japan and can be found in many homes, shrines and martial arts dojos around the world. This small structure is typically placed on a high wall and surrounded with items related to the Shinto religion. It is a way to give a physical form to a place in which one performs their own personal relationship with their religion. 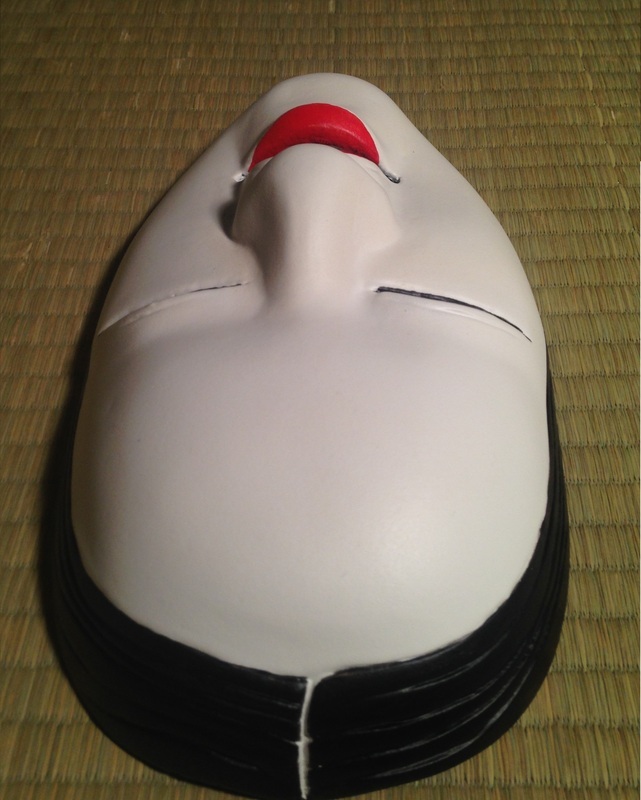 However, it does not have to be for Buddhists or those who practice Shintoism. You may use it as a way to enshrine the God you believe in our simply view it as a piece of eastern art. 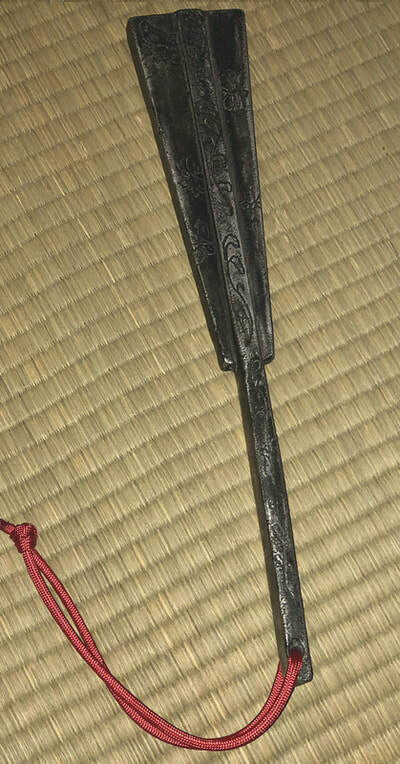 In the dojo the Kamidana is considered the heart of a traditional dojo. It holds a very special place of honor in the training hall. It is placed there to enshrine the sprite of budo and how it helps us strengthen or minds and body. There to it will be surrounded by artifacts and symbols related to the individual system and it beliefs. For more information about the Kamidana and it place in the dojo check out the page titled "Martial arts and Religion' on our site. You can also find pictures of it construction in the photos section of our site. This is a Japanese Hannya (Oni-Demon) mask. 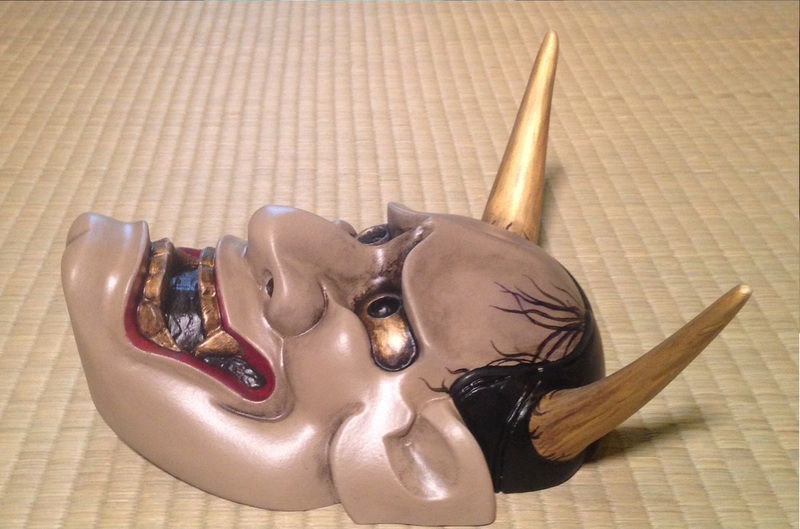 It is handcrafted and painted by myself, which makes each mask unique with subtle differences. I try never to paint the same way twice. This one was done in a dark aged paint scheme to give it an antique look. The colors are done in a dark kaki color with gold horns, teeth and eyes. 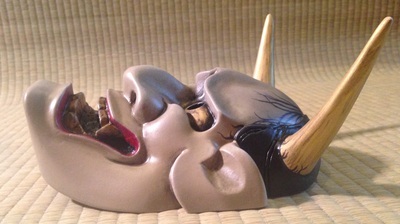 It was cast from an original wooden antique mask that I own. The flash adds a bit of glare to the otherwise darker dull matt finish. 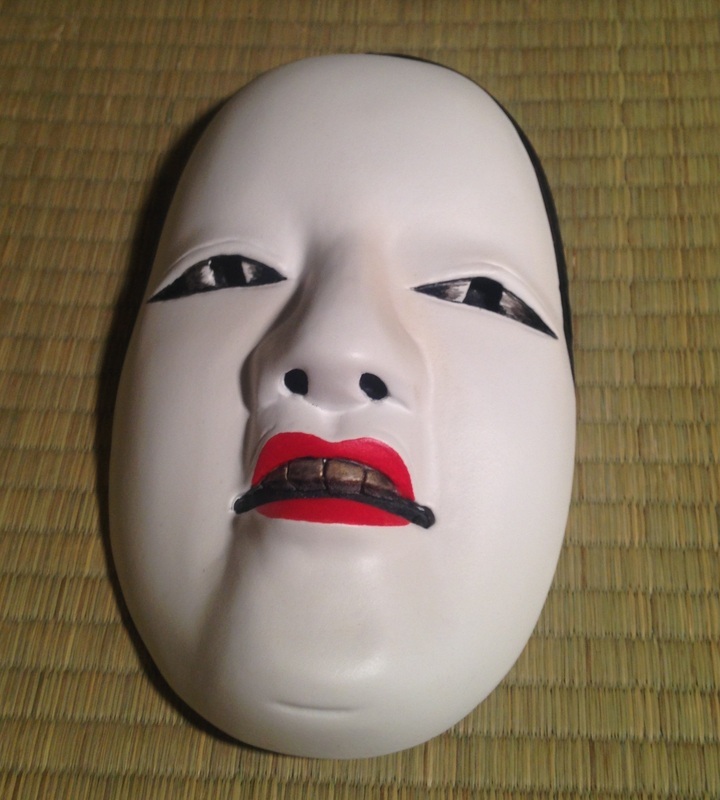 This mask is for decoration only and cannot be worn. 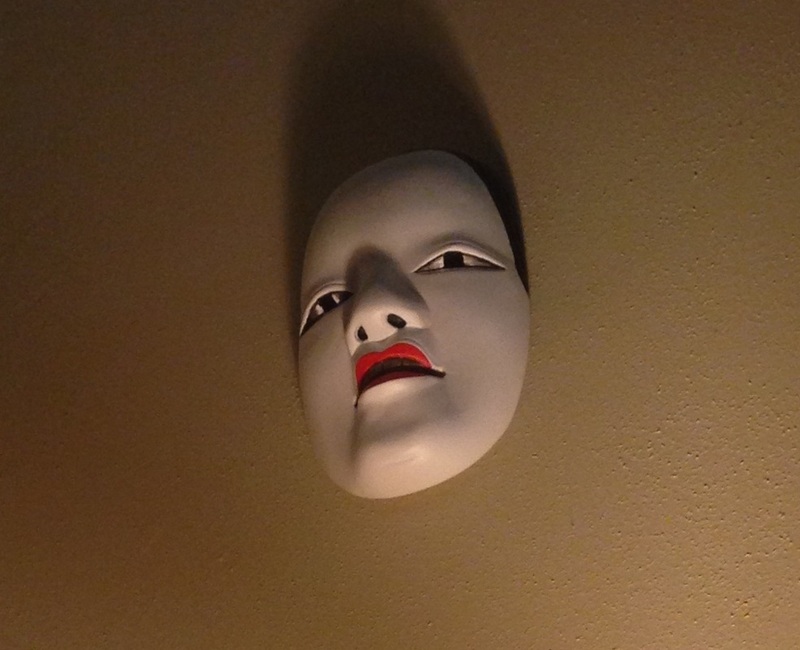 It is made of plaster and has a loop hook made into the back of it for hanging. 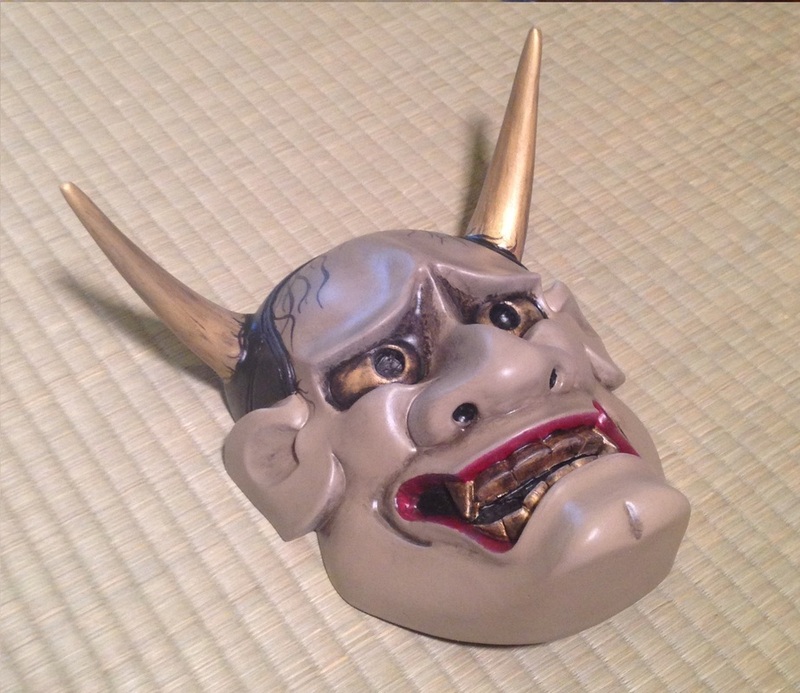 The horns were cast separately and formed into the mask, which make them very fragile. 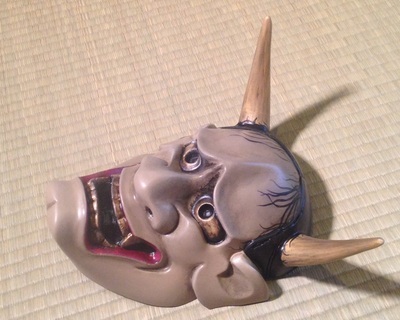 However, none of these mask should ever be handled by the horns. You can also see my signature on the back of it in the pictures. It measures approximately 8" from chin to top of head and is 6.25" wide and its weight is approximately 1.5lb.The mask is new and in good condition however, it was made to look old. 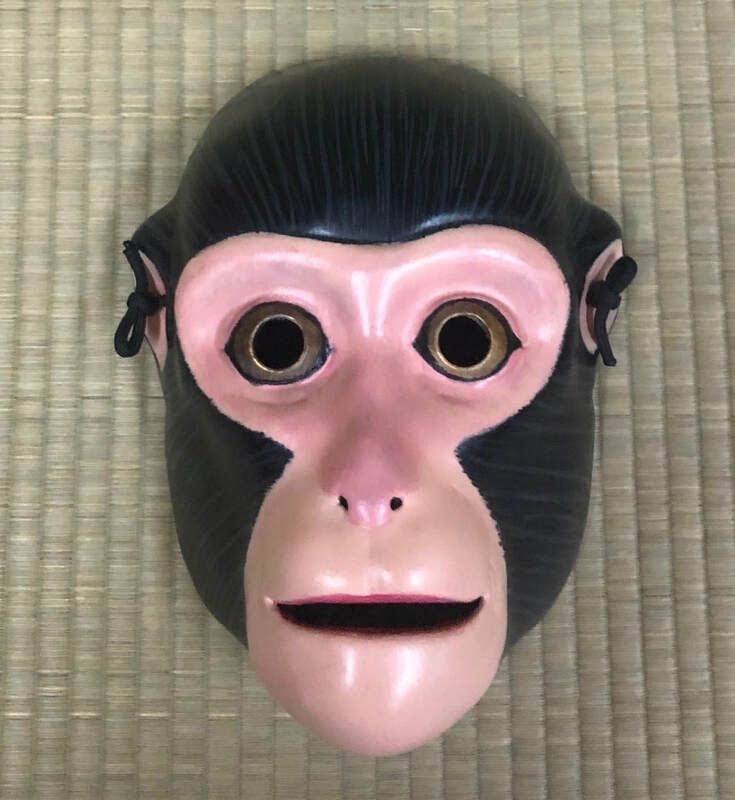 Please notice the description of the mask and look over the pictures carefully and make your decision before bidding as I will not take any returns. 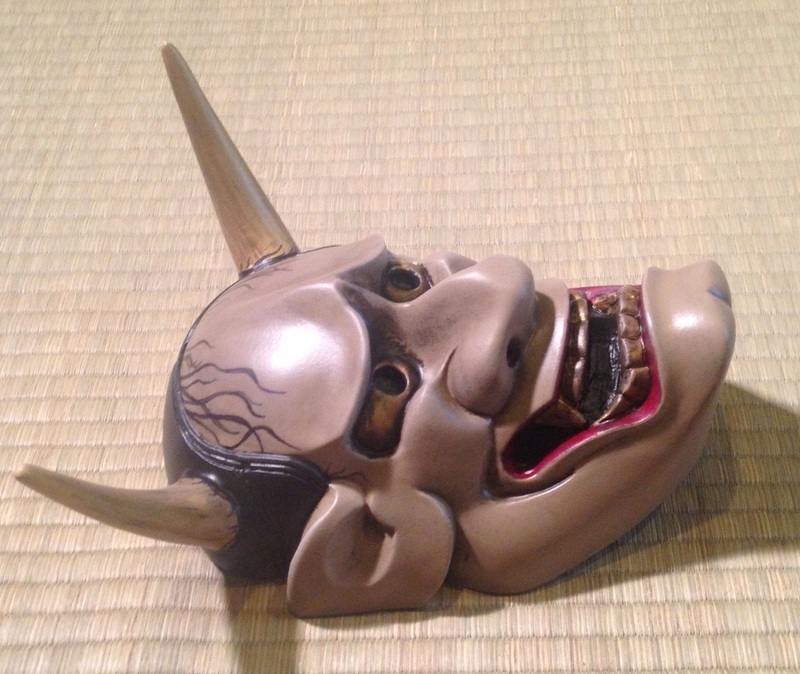 The mask in the picture is the actual mask that you will receive. 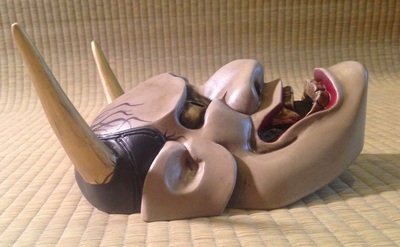 Making these masks is a hobby of mine and I try to make each one unique. 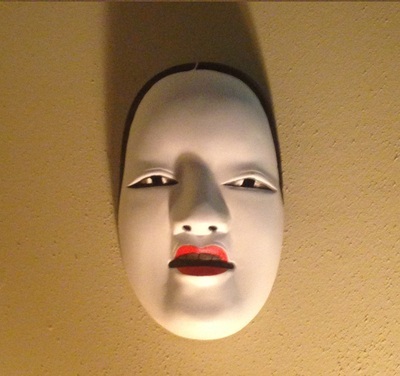 I also make this particular mask in red, metallic, white, and pink as well. Please feel free to contact me with any questions or comments or maybe you have a specific color you want. Probably the most popular and well know Japanese Noh masks is the "hannya". It is that of a vengeful and jealous woman turned demon. With its pointed horns, bulging eyes and sharp fangs, it expresses the full wrath, anger and resentment of her nature. 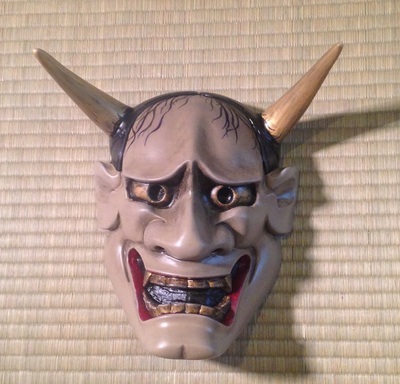 Today these mask a very common in Japan and people believe the image of the demon placed in their home will actually drive evil spirits away. I have a very beautiful antique one hanging in my home that was given to me by my students. 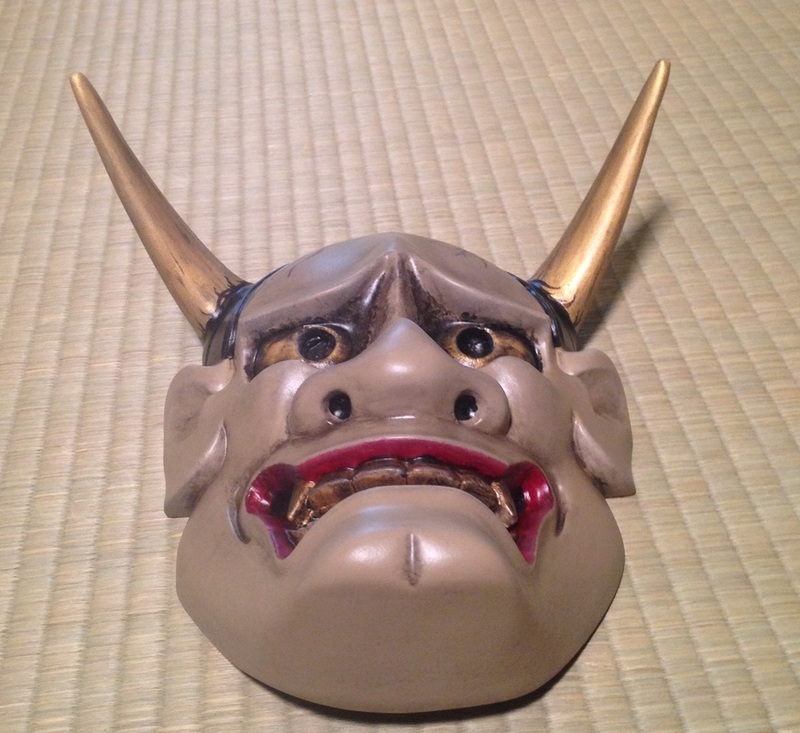 In this way it can be seen as a symbol of protection and good luck. Also to someone studying martial arts it represents yet something else, the darkness that we all have within ourselves that needs to be harnessed and controlled. This would be a great gift for one who studies budo and a meaningful addition to one's dojo as well. 16.58 to anywhere in the U.S. and will be sent with a tracking number and insurance.